Manufactured (or mobile, as most people call them) homes represent the largest stock of unsubsidized affordable housing in the United States, with nearly 18 million Americans calling them home. Their modern amenities and affordable prices make them an attractive option for people wanting to own their first homes, or to downsize. But despite their clear economic and lifestyle advantages, some people consider manufactured homes a last resort, rather than a great choice. That’s because of outdated notions about the quality of the houses, the communities where they’re located, and the people who live in them. 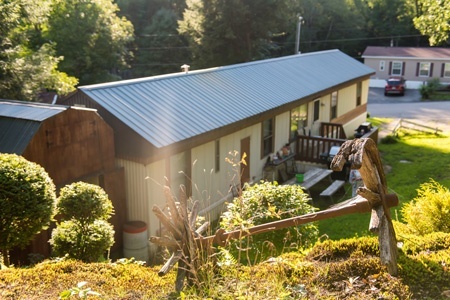 The mention of manufactured homes often conjures visions of old dilapidated trailers, and it’s true that they still dot New Hampshire’s landscape. It’s also true that you’ll find broken-down and neglected site-built homes along many a country road. Modern manufactured homes are built to federal code, in a controlled environment, and can contain all the modern amenities that we HGTV-watchers dream of. These homes are not only well-built and attractive—they’re also affordable. The average cost to build a manufactured home is 50% less expensive per square foot than a comparable site-built home, excluding land cost. My family recently moved from a big home where we raised kids and held large-family gatherings, with plenty of space and bathrooms, and a large lawn that required lots of upkeep, to a smaller downtown home on a .11 acre lot. I, like many empty-nesters, am relieved not to have to heat and light all that extra space, not to mention the yard work and the clutter we accumulated just because we had the room. My neighbors are just feet away, and we happily coexist in the dense urban block. I see and greet my neighbors far more often. I knew when Frank got a new knee and what time the kids leave for school. Chester and his dog, Honey, greet me on my way by. If they needed help, or something were amiss, I would know instantly. We now walk to our jobs and to Main Street. That is what I love about living in my neighborhood. So why do we have this notion that living in a manufactured-home community is undesirable? I work with folks in New Hampshire’s 126 resident-owned communities (ROCs). Their homes are small, but more than adequate for their needs. Their utilities are affordable and their space comfortable, on one-level, and easy to maintain. Their car is quickly accessible, parked right next to their homes. They own their homes and pay taxes on them just like I do. These homeowners collectively, as a cooperative, own the land under their homes and manage their communities. They know if an elderly person’s shades aren’t raised in the morning, help might be needed. Their streets are private and more-narrow, perfect for walking or bike riding. My experience has shown me what a great housing option this is for more than 7,200 New Hampshire households. Yet some towns’ zoning ordinances include their manufactured-home regulations in the section that deals with campgrounds! Worse yet, some towns require that manufactured homes be located at least 25 feet from the property line (a typical restriction) unless the adjacent property is zoned residential. Then the setback requirement doubles to 50 feet! We have an affordable-housing shortage, and folks way smarter than I have pointed to manufactured housing as one solution. It makes sense, and for this housing to realize its potential, professionals who sit on planning and zoning boards, city councils and select boards owe it to their communities to understand the realities of modern manufactured homes. They’re likely to be surprised that they’re not the “trailers” they remember. Manufactured-home communities combine the practical aspects of the tiny house and cluster development trends that have drawn a lot of positive attention. It is time to honestly consider all housing options, and not only consider manufactured housing as a component of the solution we are looking for, but to start planning our communities to include this common-sense housing choice. Tara Reardon is Director of ROC-NH.